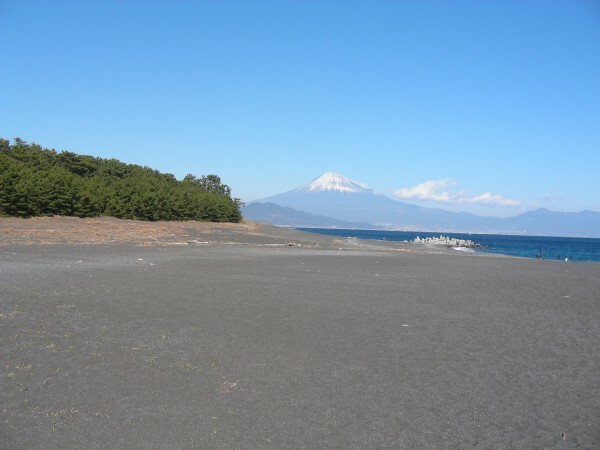 Miho no Matsubara is a scenic beach on the Miho Peninsula close to Shimizu in Shizuoka. 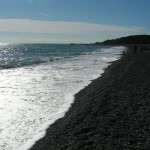 It was listed as World Heritage by UNESCO in 2013, and is part of National Park. 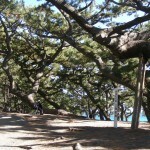 The seven kilometer (about 4 miles) stretch of beach is lined with a dense grove of twisted pine trees, bent and contorted into unusual shapes because of the strong winds. 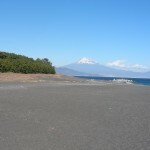 The beach is also famous for the stunning views of Mount Fuji and the Izu Peninsula, and a legend called Hagoromo, a famous drama. The famous twisted pine trees. Although not really suited for swimming (for that, head to Yumigahama), it has been selected as one of the top 100 beaches of Japan. 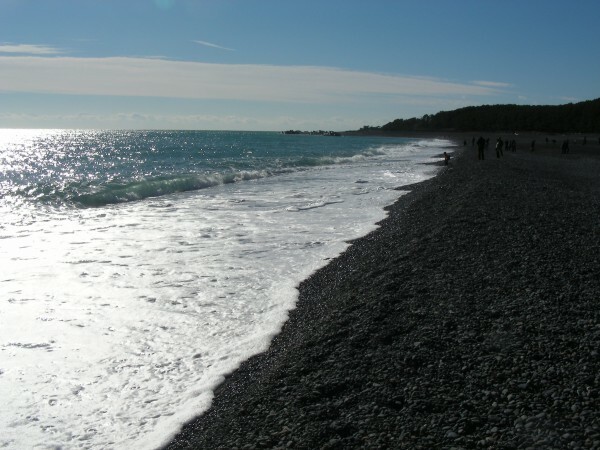 The legend is said to date back to an old pine tree, where an angel wearing a Hagoromo (a feathered cape/robe) floated down to the beach after flying over and being attracted to the blue waters and beautiful scenery. 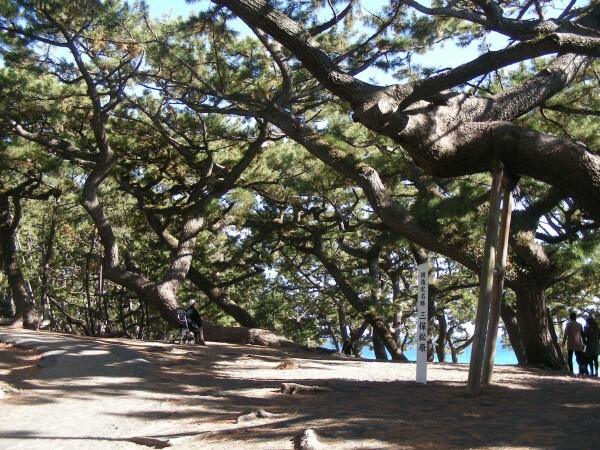 As described in the famous Noh drama, the tree called Hagoromo no Matsu is said to be where the angel arrived, hung her Hagoromo on a tree branch, and went for a swim. The remains of the famous tree. However a fisherman named Hakuryo was walking along the, retrieved the Hagoromo, and when she returned from her swim he refused to return it her unless she performed a heavenly dance for him. As she couldn’t return to the heavens without the Hagoromo, she danced for him, leaving him spellbound. The last scene has Hakuryo looking longingly skywards as she flies back to heaven. 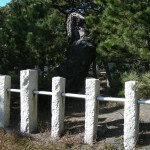 A tree stump said to be the remains of the tree where she hung her robe is still extant, next to the shrine where it is said a feather from her is preserved. On the second Saturday and Sunday each October, the Noh play is performed by firelight (Takigi Noh) and a festival held celebrating the legend. 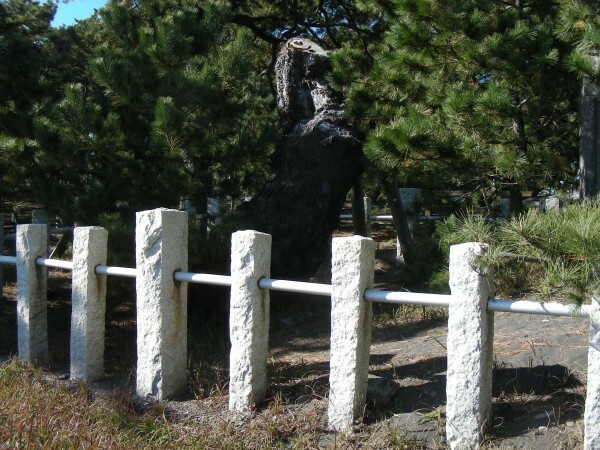 There is a statue of Hakuryo watching the dance near the entrance to the park, which is a short bus trip from Shimizu station.